Active Ingredient : Andrographolide 5% & Andrographolide 10%. Chemical Constituents and Components : Main chemical components are diterpenoid lactones, paniculides, farnesols, flavonoids, andrographolide, andrographinin, neoandrographolide and isoandrographolide. Andrographolides: 1. It exhibits antioxidant and hepatoprotective activity against liver damage. 2. It accelerates intestinal digestion and absorption of carbohydrates by activating the brush border membrane bound hydrolases of the small intestine. 3. It induces significant stimulation of the antibody production and delayed hypersensitivity responses. 4. It may inhibit HIV-induced cell cycle dysregulation, leading to a rise in CD4 (+) lymphocyte levels in HIV-1 infected individuals. 5. It shows cytotoxic activity against cancer cells. Curing Diseases : 1. It is used to cure diarrhoea, dysentery and enteritis. 2. It is useful in fever, cough, sore throat, bronchitis and tonsilitis. 3. It is used in hypertension, menstrual and post-partum haemtometra. 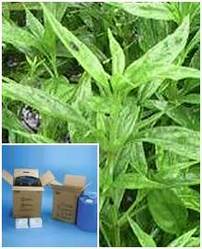 Possible Combinations : Andrographis paniculata + eleutherococcus senticosus (for cold treatment).